Maheen Nazim, the newly elected vice-president of IGNITE, said she plans to put her leadership and communications skills to good use in her new role. As vice-president representing some 4,900 UofGH students, Nazim will be part of key committee meetings with Humber College and University of Guelph-Humber administrations. She will also help host events and serve as the official spokesperson for on-campus functions. The third-year Justice Studies student said she hopes to come up with new ideas to improve existing services. 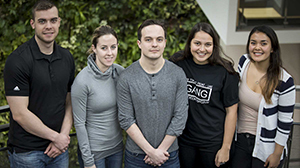 IGNITE is a student-led organization representing the voice of over 30,000 full-time Humber College and UofGH students. The 2018 election saw some 8,489 students cast their ballots to elect 13 new members. Last year, Nazim unsuccessfully ran for a position with IGNITE's board of directors. Even though she did not win, she chose not to be discouraged. The experience fortified her resolve to try again. "Getting myself involved in the election really struck a chord with me," Nazim said. "I love speaking to students and generating and envisioning ideas for the future with my peers. Elections give candidates a small taste of what real change can sound like. Simply put, I know our students are looking for bigger and better things and I want to be the person that helps get that done." Nazim has several ideas that she would like to implement during her term as the vice-president of IGNITE and they fall under three broad categories: academic advocacy, student communications and enhanced student experience. "I am looking to get summer placement opportunities for all programs at UofGH," Nazim said. "Secondly, I want to seek partnerships with our technology departments to help address everyday issues and ensure students are able to find relevant information easily. Last but not least, I hope to secure some local partnerships with restaurants to bring more student discounts and cheaper food near campus." Over the past years, Nazim has demonstrated her leadership qualities on campus in several ways. As an academic program representative, she developed, presented and executed several ideas from start to finish last year. This year, she was an Alpha Phi Sigma volunteer and helped set up events.